Now if that’s not enough to hook a reader of fiction into it, I honestly can’t think of what would be. The voice is that of Dell now 60-something, but age 15 at the time of the story. 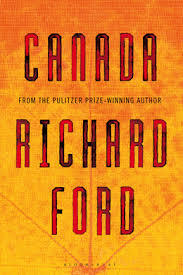 Ford has an extraordinary sense of the here-and-now emotions and in this book develops the feeling of anxiety one lives with as normal. How can a 15-year old know there’s something seriously wrong going on in his living situation? How could anyone know what the parents were up to – or had just done – much less teens going through their own issues? The Parsons family looks “normal,” if poor, and is somewhat isolated by circumstances as well as by choice. They now live in Great Falls, Montana, the center of the state. The setting is important only in that it’s isolated and near an air-force base. Dad, Bev Parsons, is a handsome “charmer,” an Air Force retiree originally from Alabama, while Mom is an intellectually oriented and fairly rigid Jewish mom-type. The two children, a boy, Dell, and his twin sister, Berner, are a mix of each and understand their parents are not well-matched as well as that Mom is unhappy, that Dad loves her madly. Dell says they always love them. I suppose this is a coming-of-age story of sorts – I usually really dislike those but this one is really quite enjoyable. It’s first person and I think I got a bit hung up on whether or not Dell is a reliable narrator – well … that depends. Basically I really enjoyed the story but Ford spent a bit too much time on winding it up, philosophizing, trying to find some meaning or, if there is none, leaving it alone? The first pages of the book tell us that it takes place in 1960. Later there are mentions of the Space Needle in Seattle. The Space Needle was built for the 1962 World’s Fair there and I doubt it was built 2 years early.